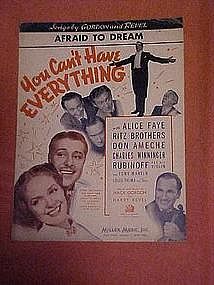 Sheet music from the 1932 movie, "You can't have everything", starring Alice Faye,Ritz brothers,Don Ameche and others. Music and words by Mack Gordon and Harry Revel. Good condition, corner bends.